An advent calender for all the candle addicts everywhere. "Count down to Christmas with this collectable advent calendar from the world's favourite candle company! Every day reveals a tealight candle in one of six seasonal scents, including an extra treat in the 24th! Light a new Candle each day and celebrate the festive season with your favourite Yankee® fragrances. Fragrances included are: Snow In Love, Balsam & Cedar, Merry Marshmallow, Red Apple Wreath, Snowflake Cookie,Sparkling Cinnamon"
Now I'm sure most are thinking this is right up my street and you would be right had it contained more than six scents. In my opinion Yankee do so many Christmas fragrances that it seems almost criminal, boring and lazy that they have only included six fragrances. It would have been far more exciting if it was a different scent each day even if they had to include a few non-Christmas variations. 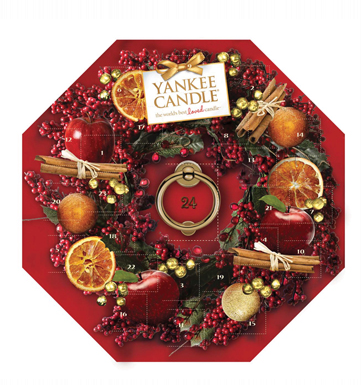 I'm not a betting woman but if I was I would place money on the the surprise behind door number 24 being a Yankee Votive in the fragrance Christmas Eve...that's what I'd include anyway. Oh my gosh this is amazing! I was going to pick up the Boots beauty calender but now I'm torn! Obsessed with Yankee candles and am currently burning "Be Thankful". I already bought it two days ago. 6 scents is definitely a bit disappointing, but a lovely idea nonetheless! I agree, when I got the email I was really excited but when I saw it was only 6 scents I wasn't impressed, had it been a little more creative I would of had it in a heartbeat! I love this! May have to splash out! I think I'd rather have a Boots or Ciate advent calender if this only have 6 different fragrances! I'd love this if there was a difference fragrance behind each door. I wish it came in more scents too! I love Yankee Candle, but I think I am going to go with something a little more beauty based.. No chocolate for me!